Stock photo of the BrewHouse at Whistler Restaurant and Pub with trees lit up with decorative lights at night along the Village Stroll, Whistler Village, British Columbia, Canada. 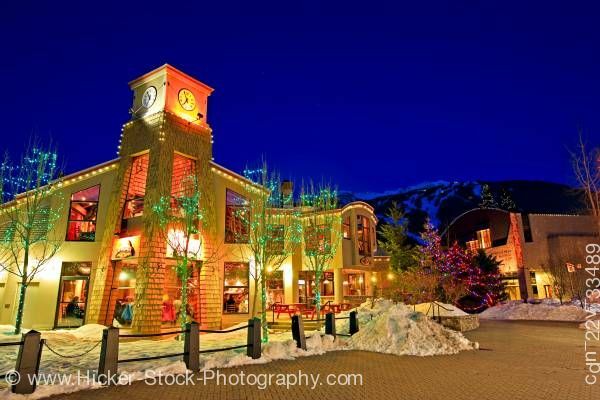 This stock photo includes The BrewHouse at Whistler Restaurant and Pub with trees illuminated with decorative lights at night along the Village Stroll, Whistler Village, British Columbia, Canada. The High Mountain BrewHouse is Whistler's busiest spot whether it's summer, autumn, spring or winter. The cuisine is Northwestern, and the Brewery produces four different handcrafted ales and two lagers as well as specialty seasonal beers. You can watch the Brew Master at work while enjoying his handiwork.